Update: ATK just sent me a new review that considered newer chef’s knives that have come onto the market, and the same knife won again! They say it has now been on top for 20 straight years. You can see the methodology and full rankings here, but it requires a free registered account. There’s also a good embedded video that doesn’t require registration. Some of you may be familiar with the PBS cooking show America’s Test Kitchen. The same company publishes the magazines Cook’s Illustrated and Cook’s Country, which you can think of as Consumer Reports for cooking in that they do not accept any advertising and are entirely subscriber-supported. I happened to find a bunch of back issues on sale at a community garage sale a few weeks ago for a dollar. Wow, I can only describe the content as heaven for cooking geeks! Lots of good tips inside. Cook’s Country tested the 8-inch chef’s knives from all the major brands that cost under $50 – Wusthof, Henckels (various), MAC, Calphalon, OXO, Chicago Cutlery, Victorinox and Farberware. The bargain chef’s knife winner? 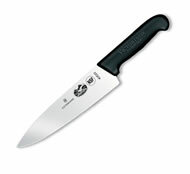 The Victorinox Fibrox 8-Inch Chef’s Knife outperformed many more expensive competitors including a $50+ knife from the Wusthof Gourmet line and everyone else. The knife was judged to be sturdy, stayed sharp, and had a well-designed, comfortable handle. Amazon has 700+ now 3,000+ reviews with a 4.8/5 star average. Another frugal chopping tip is that you don’t really need expensive cutting boards, let alone multiple ones for food safety reasons. Simply buy a set of flexible cutting mats to place on top of one cutting board or durable surface. They are thin yet sturdy, and can be rolled up like a funnel for transferring ingredients easily. You can get a set of four CounterArt Flexible Cutting Mats for only $8.50, which are the current best-selling ones on Amazon. Comes with Microban antibacterial stuff and is dishwasher safe.